As many of you know, ripping activities are something I like to have the children do. I found this cute little bunny that incorporates that skill. We used a piece a piece of brown construction paper for the bunny. You can fold the paper in half, draw half of the bunny, and have the children cut it out--symmetry. 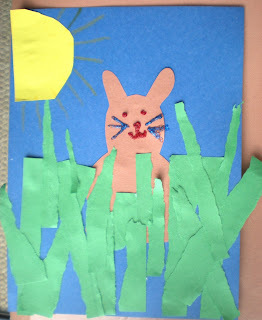 Have the children glue the bunny onto a piece of 9 x 12 piece of paper. Now give the children half a piece of green construction paper. Have them rip the paper into strips. The strips can be different sizes; long, short, fat, thin, the different sizes and some pizazz to the grass. After the grass is "grown" it's time to add it to the paper with the bunny on it. Put some grass over the bunny's body to make it look like he is peeking out. To finish the bunny off he will need a face. We had some glitter glue so my little guy wanted to use that. You will also see he wanted to put a sun in the sky. Have fun.